The Battle of the Bulge was the largest and most costly battle fought by the US Army in World War II. The Ardennes fighting was Hitler’s last gamble on the Western Front, crippling the Wehrmacht for the remainder of the war. 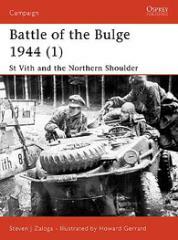 In the first of two volumes on the Ardennes campaign Steven Zaloga details the fighting in the northern sector around St Vith and the Elsenborn Ridge. Sixth Panzer Army, containing the bulk of German Panzer strength, was expected to achieve the breakthrough here. It was the failure around St Vith that forced the Germans to look south towards Bastogne.